You’ve been talking about vocational education in the campaign. In your ‘roadmap,’ you talk about putting together a panel to look at that and how it looks in Indiana. Can you explain the process and what you expect to see happen with vocational education? PENCE: As I’ve traveled around the state the last year and a half — a state with more than 8 percent unemployment — one would expect to walk into businesses and see a sign on the door that says no jobs available. But frankly, almost as often, talking to employers large and small in Indiana, I’ve heard that there are jobs available but they can’t find workers to fill them — people with the backgrounds and the training to be able to fill those positions. It’s what economists call a skills gap in Indiana. And I’ve seen it. I’ve talked to people about it. And it’s what’s led me to the conclusion that Indiana has an opportunity to lead in education reform in a new respect and that is, I think our schools ought to work for all of our kids, regardless of where they start in life, but also regardless of where they start in life after high school. My proposal would be to make sure that every high school graduate is either college ready or career ready by making career, technical, and vocational education a priority in every high school in Indiana. Again, we propose to do that on a regional basis because that’s what’ll make sense. The reality is that the jobs that are available in Kosciusko County are different from what’s available in Vanderburgh County. The needs in Northwest Indiana are going to be different than the needs in Wayne County in Richmond. What we suggest in a short period of time — read that ‘less than a year’ — we would create Indiana Works Councils that would bring together business leaders, education leaders, local civic leaders to design curriculum for career pathways in high school for jobs that are available in that region, in that community. I think this is the right thing to do for our young men and women, it gives them an opportunity to go out and get in the workforce, but I also believe this is going to improve our educational outcomes. When a lot of our kids see that there’s a pathway to a job in high school, I think it’s going to increase our graduation rates. The reality is that more than half of the dropouts in this country, according to national statistics, actually drop out while they’re making a passing grade. So I really believe this is right for our kids, it’s right for our futures and of course, having a better-educated, better-skilled workforce is going to be great for the Indiana economy. What kind of costs are we looking at to get a robust career and technical education program going throughout the state? PENCE: I think those questions are exactly appropriate for the budget process in the legislature. I think there is going to be a need — I have an open mind about some additional public investments to see if we can catalyze a greater emphasis on career and vocational education. But I think it begins by planning it first. I also envision the possibility of private investment here. If I allow your business to sit down here in Central Indiana, or in Bloomington, Ind., and design a curriculum that is a career pathway for someone to come to work in your industry or in your company, don’t be surprised if I show up a little later to ask you to maybe help us with the resources to make that career training happen — whether that’s a partnership with internships, maybe it’s donating equipment, maybe it’s lending expertise or even direct financing. But I really do believe that creating regional partnerships is going to invite public and private partnerships and investment by businesses into our local schools that’s going to make sense for them and it’s going to mean dollars for our schools. I really believe that and in talking with businesses large and small, there’s a lot of openness to it, because again, they’re spending that money now hiring men and women into their company and spending a lot of money training them to get them up to speed on their computer software or their accounting systems or how to use particular types of equipment or what the practices are in a management environment. If young people are able to learn those things and get those industry certifications and that training in high school, that saves dollars for businesses, and those may well be dollars that we ask them to invest in strengthening our local schools. It sounds like a Cummins-type of model. You’re from Columbus, right? It sounds like the model that you’re talking about with these types of public-private partnerships. PENCE: The parternship that Cummins has forged with our postsecondary schools in the area as well as the high schools is one of those organic examples around Indiana. But interestingly, it’s not the only place you can find it. You look around the state of Indiana, you’ve got the READY Program in Northwestern Indiana where you’ve got a series of communities that’ve come together to promote vocational education because of drastic shortages in workforce areas. You’ve got four counties in Northeastern Indiana doing the same thing. Vanderburgh County is breaking through on this. Warsaw in conjunction with Ivy Tech, the Warsaw schools are working with the medical device industry to create vocational pathways. This is happening organically, and there’s nothing more powerful than an idea whose time has come. And that’s why I think if we simply endeavor to make career and technical education a priority, we’re going to have partners all over the state of Indiana that are going to be anxious to make that happen. To switch gears to a different area. Pre-K is something that your opponent has talked about and that you’ve also put into your roadmap in terms of building what you talked about as building “community-based” Pre-K options. I’m wondering what exactly you mean by this, how you envision this kind of thing playing out, and why it would be better than what your opponent is proposing — a pilot, state-run alternative. PENCE: Let me begin with, first, principles: I think the best Pre-K program is a successful and prosperous family that can have the resources and the income to provide for their kids the kind of support in those early years that our little family was able to provide for our kids and where I grew up. But the reality is in many communities in Indiana and many families in Indiana, that’s not possible. We’ve got kids that are at-risk, we’ve got underprivileged kids that are essentially starting behind in some very, very basic ways, so I’m very open — with a particular focus on underperforming kids and at-risk kids in this state — to looking for what is, again, an indigenous and developing infrastructure around Indiana of private pre-K programs. You mention my hometown of Columbus, Indiana. We’ve got a program down there called Busy Bee, and I was witness of seeing some kids out of some pretty tough circumstances with their eyes lit up and doing the kind of foundational learning that was truly inspiring to me. But it’s all provided for, there’s local support, there’s corporate support, there’s involvement from the philanthropic and — in many communities — the faith-based community. What I would purpose to do if I was elected governor of Indiana is 9:06 use that existing infrastructure around the state of Indiana, identify where that’s not happening in communities and see if there’s a way in working in conjunction with the legislature to find ways that we can make Pre-K programs — local, organic Pre-K programs more successful and more available to at-risk kids in our state. With vouchers? Tax subsidies, tax credits? How do you push that from a policy perspective? PENCE: I think that’s a proper question for the General Assembly. I was pleased when the House Republican majority announced that jobs and education were their top priority and they also spoke with some interest about the issue of Pre-K education. For underprivileged, for at-risk kids, there’s no question that there’s both a need and a benefit in Pre-K. But finding the way we can catalyze it— My one overriding principle is that I don’t want to replace what is happening in communities around the state of Indiana — faith-based organizations, private philanthropy organizations, simply private efforts supported by local businesses to provide Pre-K programming for our kids. I want to examine ways that we might be able to catalyze that, give incentives for it to continue to grow, and in that sense, build on what’s happening in Indiana for the good of our kids. Could a public solution could be part of that mix? What John Gregg has proposed is a small private program — 40 schools. We’re not talking about a particularly expensive program — it might not cost $10 million — and a lot of people would argue that’s money that’s very well spent, especially given the fact that Indiana doesn’t have a state-based option, why should the state not be that player? PENCE: My view is that we already have a pilot program across Indiana. Busy Bee’s a good example of it, you have pilot programs all over the state of Indiana that have been generated in one community after another. It’s a difference in our approach, and I recognize that. Elections are about choices. But for me, what I think the next administration and the next legislature should do is ask how could we catalyze and encourage the expansion of those local programs that are already developing around Indiana and make them more available for underprivileged kids. You praised Indiana University in the first gubernatorial debate for its tuition incentives. But the thing about these tuition incentives is that students only save money if they take advantage of them. It’s an incentive to save money, but they may not actually save any money. How do you really think the completion-incentive approach ends up working? PENCE: The first thing is that we have to recognize Indiana rates fairly poorly in on-time completion. As a father with two kids in college right now, and a third one about to start, so you don’t have to tell me about how much a college education costs these day. We’re living it every day at our house. Five years of college costs more than four years. Four years costs more than three years. I think a lot of Hoosiers don’t realize that it’s different than 30 years ago when, at least the college I went to, you got a four-year degree and very few take more than four years to finish. Now, it’s really the exception to the rule, the overwhelming majority of students will go on past four years. That puts an additional burden on them and their families, with the costs of student loans and the rest. 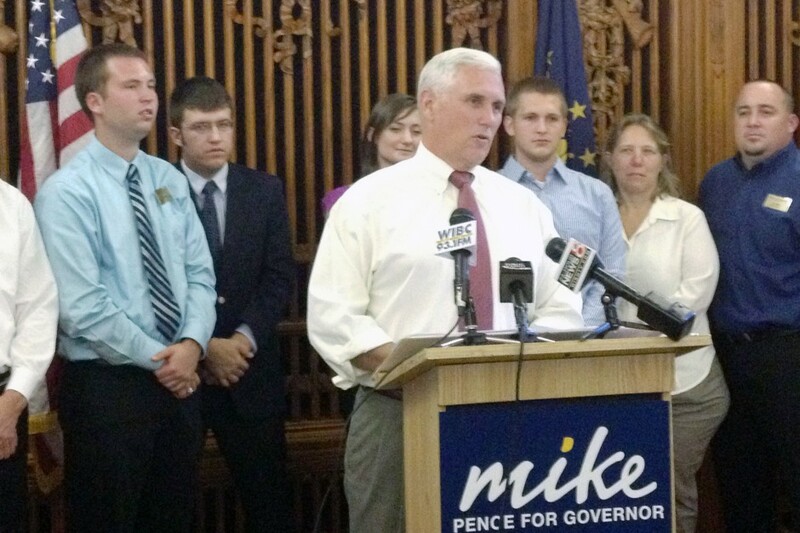 What we’ve proposed in our Roadmap for Indiana is a two-part solution. We want to tie the funding formula for public universities to on-time completion rates and give a real incentive to our universities to say, ‘Taxpayer resources are going to be available in increasing measure to the extent that you decrease the amount of time that it’s taking kids to finish at your school,’ and that’s why I took the point to commend Indiana University. It seemed to me they stepped forward and provided some real leadership and said for people who are on-track for on-time completion at the end of their sophomore year, we’re going to freeze their tuition increases. That’s another piece of our proposal a couple months ago that, in addition to creating a funding formula incentive for universities that we also create essentially an incentive for students to finish on-time, or early. It just seems to me, right now, with regard to the resources we provide to our public universities and the basic pathway that students will pursue in many of our universities around the state, it’s not intentional toward degree completion in the allotted period of time, and we want to drive toward that. First, getting the universities to think and be more intentional about it. But also have the students from go come in and say ‘Look, there’s an incentive for you to figure out how to get a four-year degree done in four years.’ I think the effect of that is that Indiana could be a real leader in making college more affordable. There’s other ways to deal with it, and I’m open to discussions about that, I support the efforts by the Higher Education Commission and their efforts to begin to deal with the issue of rising costs and making college more affordable, but I think this is a good start. And having Indiana University step forward and provide some leadership by example, in that regard, was refreshing. On one hand, you have the completion incentives. On the other, there’s the idea of linking financial aid to being on-track to completion to some degree of closeness. What it strikes me is that the reason we would have low overall college completion rates is that there are people who would not be traditionally successful in a college environment, and that maybe we need to do more to give them money to finish school, as opposed to say, ‘If this isn’t working out for you, then we’re not going to subsidize you for it.’ It would seem like this would be the last thing we would want to do to try and up completion rates. How would you respond to that? PENCE: We use the carrot and the stick here with students. 16:46 You mention, we left out our grant program where we provide grants for on-time completion and early graduation to help go out and buy that first car or make your security deposit on your apartment when you graduate. We want to incent people by making some modest grant support. But yes, I think we should say in financial aid that the objective here in financial aid needs to be on-time completion. Right now, for the most part, we don’t connect financial aid whatsoever to on-time completion or the successful completion of a degree program. We simply, essentially, say ‘You’re in school, you’re entitled to financial aid.’ While that sounds broad-minded, the reality is that with students graduating with enormous student loans, and sometimes not having even graduated from college with enormous student loans, we’ve got to find a way to do better. I think we can by giving incentives to students in the grant program, but also saying we want you to understand that our purpose in our financial aid program is going to be to facilitate and help you complete your degree on-time. During Dr. Bennett’s State of Education address last month, he talked about the possibility of pushing for district takeover to broaden the kinds of accountability Indiana schools are held to. Is that a policy you support? 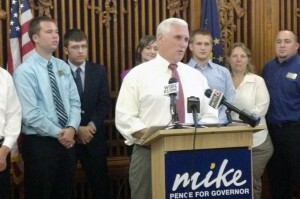 PENCE: The policies on education reform that we’ve articulated in Indiana are really built on a couple of principles. Number one is that I think there’s nothing that ails education in Indiana if you give parents more choices and teachers more freedom to teach. I strongly support the grading system that we’ve put into effect, and all you need to do is look at the outcome — 20 percent of our schools received an F grade, 50 percent received a C or less — to know that we’ve got work to do. I think performance measured is performance enhanced. We’ve not advocated a district rating system, but I’m open to suggestions from Dr. Bennett, from members of the General Assembly, about how we create greater transparency and greater accountability, but it’s about also being in a position to reward the school systems, the schools, the educators, that are succeeding. And my lone star in education reform is how do we fund excellence? How do we create the transparency and the accountability and the high standards that allow us to allow resources to flow to the outcomes that everyone wants to achieve. In our roadmap for Indiana, we make our goals very clear. We want to increase performance in reading and math skills in elementary, and we want to increase graduation rates. Focusing on those goals and how we get there will be an ongoing dialogue with Dr. Bennett and with members of the General Assembly. Obviously Mitch Daniels has been known as a governor who’s put a priority on education and has worked closely with the Superintendent of Public Instruction to push some of those initiatives and those goals through. Is that something you see for yourself as well, if elected? PENCE: Other than public safety, there’s nothing more important that Indiana does than educating our kids. And I come by that pretty honestly too. My wife’s been a career schoolteacher — spent about half her time in public schools, half in private. My father-in-law, her stepfather was the state Teacher of the Year in 1986, so we come from a family of educators and we cherish education. And that’s why I know, at our house, we think teaching is a calling, and Indiana has some of the best teachers in the world, but the reality is that we face real challenges in education in Indiana. While test scores are going up, graduation rates are going up, we’ve got plenty of room for improvement. Even with the improvements that we’ve seen in our test scores, Indiana is facing some real challenge. That’s just thinking domestically. But globally in some key areas, particularly STEM education, Indiana — like most places in America — are lagging well behind. I’d like to see use continue to promote an atmosphere of innovation and reform that really puts a focus on our kids that empowers parents, but let me emphasize this point: If I’m elected the 50th Governor of Indiana, I’m going to come in with a heavy bias to say to the Department of Education and the education establishment in regards to our teachers, ‘Let ‘em teach.’ I believe that teaching is a profession. I believe the Department of Education ought to be able to create high standards and evaluate whether or not we’re achieving those standards for our kids. In between the high standards and the accountability, we ought to let them teach. In between giving parents more choices, giving teachers more freedom to teach, I think it’s a pathway towards educational excellence. What do you mean by that? Evaluations are probably one of the things that teachers look at and say, ‘How is this going to make me better? How is this going to make my school better?’ It probably goes against that goal of giving them more freedom to teach, doesn’t it? PENCE: I said we ought to have clear goals and standards and then we ought to have accountability for the educational outcomes for our kids. And we ought to have an information feedback loop for teachers. But I think there’s a real argument, and I look forward to engaging with the Department of Education, legislators, teachers and superintendents to say how can we free up that classroom time and allow teachers to have the freedom and the flexibility to do what they know how to do? I really do believe it. I’m biased by the fact that I’ve been married 27 years to a schoolteacher. And I really do believe that our teachers have the ability to go out and do their job and I think that the fact that we’ve reduced seniority as a priority when it comes to promotion and retention, I think we have an even greater opportunity to continue to advance our teachers who are already out there doing the job — we oughta be rewarding that in a variety of ways, including finding ways about how we give them more freedom, more flexibility to achieve the goals in the classroom that we all long for for our kids, which is we simply want the best educated and best-skilled workforce in America. We want our schools to work for all of our kids regardless of where they start in life, and regardless of where they start. I’m curious about your statement on choice. I think people would look at Indianapolis as an example and say there’s a lot of choice. This market has a lot of charter schools in it, as well as private schools available through the voucher program, but test scores at Indianapolis Public Schools haven’t improved. I think there are people who worry that choice may not be improving problems for all, but that it creates a two-tiered system of education. And I’m wondering if choice, in that respect, doesn’t create a problem? PENCE: For more than 20 years, I’ve believed that giving underprivileged kids the same choices that middle- and upper-middle-income Hoosiers have is simply the right thing to do. I think allowing parents to choose what they believe to be the best public school, the best public charter school, or the best private school for their kids is best for them. But I also believe the competition makes everybody better. Right now, we’ve got 9,000-plus kids in school using the voucher program. We have a million kids in school in Indiana. So we’re just at the starting end of this. We’ve got charter innovation, but I want to look for ways we can encourage more innovation and more public charter schools in the state of Indiana. As we continue to promote a climate that focuses on achievement for our kids and focuses on the objective of increasing graduation rates and improving math and reading skills in elementary school and looks at expanding vocational education and looks at ways we can promote Pre-K opportunities, I think we have a real opportunity for Indiana to be a national leader. You create that environment of innovation and of competition, all driven by parental choice and by greater freedom and flexibility in the delivery of education services in this state and I think in a short period of time, Indiana could be in the lead in the Midwest, if not the country, not in just reforms, but in the outcomes that those reforms are driving to achieve.